Hairspray is bouncing back to Newcastle's Theatre Royal. Newcastle Theatre Royal audiences can prepare themselves for a week of beautifully coiffed fun once again as the crowning glory of feel-good musicals Hairspray returns to the city next week from Monday, June 25 to Saturday, June 30. It’s Baltimore 1962, where Tracy Turnblad, a big girl with big hair and an even bigger heart, is on a mission to follow her dreams and dance her way onto national TV. Tracy’s audition makes her a local star and soon she is using her new-found fame to fight for equality, bagging local heartthrob Link Larkin along the way. Based on the 1988 film of the same name, Hairspray the musical originally opened to rave reviews on Broadway in 2002 and subsequently won eight Tony Awards. Later after a run at London’s Shaftesbury Theatre in 2007 the show won four Olivier Awards including Best New Musical. 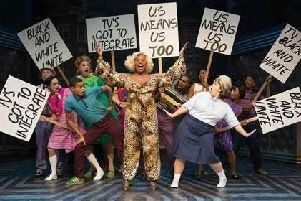 Proving to be an international success, Hairspray has also opened in South Africa, Japan, South Korea, China and Dubai. Following the musical’s phenomenal success on stage, a film of the musical was released in 2007 which starred John Travolta, Michelle Pfeiffer and James Marsden. The show was last at the Theatre Royal in January 2016 where it was a huge hit with audiences and critics alike. Raquel Jones (The Bodyguard, Jesus Christ Superstar) will be returning to the role of Lil’ Inez having played the part for two years during the West End run of the production at Shaftsbury Theatre. Shak Gabbidon-Williams will be making his professional debut as Seaweed and Dan Partridge (Mama Mia!, Sleeping Beauty) takes over the role of Link Larkin from Edward Chitticks. They are joined by former X Factor contestant Brenda Edwards who will continue in the role of Motormouth Maybelle. After finishing the 2005 ITV competition in fourth place under the tutelage of Sharon Osbourne, Brenda went on to star in long-running musicals such as Chicago (Adelphi and Cambridge Theatres) and We Will Rock You (Dominion Theatre and UK Tour). The line up is completed by Jon Tsouras (A Chorus Line) as Corny Collins, Matt Rixon (The Ladykillers, Around the World in 80 Days) as Edna Turnblad, Gina Murray (Chicago and Full Monty) as Velma Von Tussle and Annalise Liard-Bailey as Penny Pingleton. Established musical theatre performer Graham MacDuff will play the role of Wilbur Turnblad alongside Gemma Lawson as Amber Von Tussle and Rosie O’Hare now in the leading role of Tracy Turnblad. Featuring the iconic music and lyrics by Academy Award, Tony and Emmy winning duo Marc Shaiman and Scott Wittman, the show is choreographed by Olivier Award- winning Drew McOnie with direction from Paul Kerryson.